News at Spencer Public Library: DIY Club, January Movie and More! DIY Club, January Movie and More! Happy New Year! The DIY Club at Spencer Public Library will ring in the New Year with a project that will make you the envy of any gathering – chalkboard serving platters. We will jazz up a plastic platter with chalkboard paint to label whatever you are serving. The library will be showing the movie Sully starring Tom Hanks. 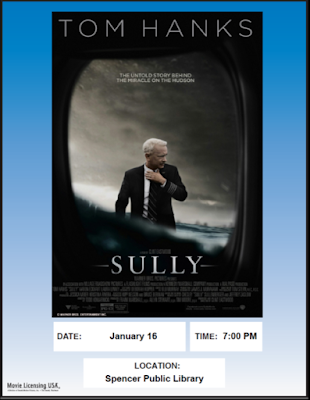 Sully is based on the true story of when Captain Chesley "Sully" Sullenberger (Tom Hanks) made an emergency landing in New York's Hudson River after US Airways Flight 1549 strikes a flock of geese. An inspirational movie everyone will enjoy. Sign-up to read the classic, military drama, The Caine Mutiny by Herman Wouk. The Caine Mutiny is a 1951 Pulitzer Prize–winning novel. The novel grew out of Wouk's personal experiences aboard a destroyer-minesweeper in the Pacific in World War II and deals with, among other things, the moral and ethical decisions made by sea captains. In February we will watch and discuss the movie, The Caine Mutiny, starring Humphrey Bogart, Jose ferrer, and Van Johnson. With funding from the National Science Foundation, the library is happy to present Pushing the Limits a book club meets science café for an experience you won’t want to miss. In January, we will explore the theme of nature while discussing the book When the Killing’s Done by T.C. Boyle. It is very informal and even the science challenged among us (me) will realize that science is all around us. The library has partnered with High School Science teacher, David Munson, who will guide the discussions. Door prizes will be given away and the library will provide dinner at the program along with free books for the first five who sign-up! Other attendees will receive books to check-out.